PHD2, that is, as in America’s premier auto-guiding software. I have written about the program, originally done by software wizard Craig Stark and now carried on as an open-source project, a time or two before, but lots of people still have lots of questions about it. It’s rare that my virtual mailbag doesn’t contain a missive pleading for help with PHD. Before offering some of that help, I suppose I should explain what PHD2 is for the uninitiated. You’re probably more knowledgeable than I was when I began astrophotography. Unlike me, you know you can’t just point your telescope and camera at a deep sky object, open the shutter, and walk away. You have to guide. The gears in most mounts are not precise enough to allow the scope to track precisely enough over longer exposures to keep stars round without some intervention. To keep stars round, you watch a “guide-star” either with the main scope or a small auxiliary telescope, a guide scope, keeping it precisely centered. Or a little camera does that watching for you. There are some mounts that will allow you to dispense with guiding for long exposures, but you are talking about mounts in the 10micron class, expensive, top-tier mounts. Proletarians like yours truly guide their mounts throughout long exposures. How exactly do you do that guiding? Well, back in the day, you monitored a guide star in a crosshair eyepiece in the guide scope or in an off-axis guider, and pushed buttons on a hand-paddle—what we called our non-computerized telescope mount hand controls—to keep the star centered. Naturally, when computers and CCD cameras came along, we were more than happy to pass the onerous task of guiding to them. A guide camera is used to watch that guide star, but most guide cameras cannot guide the telescope mount without the help of a laptop computer and an auto-guiding program. That program is the brains of the outfit, and that is what PHD2 is, auto-guiding software. If you need direction on getting PHD2 downloaded, installed, and initially configured, please see this (fairly) recent article. Today, we’re going to focus on what you need to do to get PHD2 performing by fine-tuning its default parameters. What you have to do to get those pesky stars round. What does “PHD” stand for, anyway? It ain't “doctor of philosophy,” but instead, “push here dummy.” Mr. Stark’s original goal was to produce an auto-guiding program that was as simple as it could possibly be. One that would allow you to hook everything up, push one button and guide your way to round star heaven. That’s actually possible in some cases, but due to the nature of the beast, often not. I am frequently asked by newbies how they should guide. Should they use an ST-4 connection, a direct connection from a camera to a mount’s auto-guide port, or should they guide through the hand control’s serial port? I asked myself that very thing years ago when I first essayed auto-guiding. Some people think serial port guiding, particularly “pulse guiding,” a feature of some ASCOM telescope drivers, is better since each guide message going to the mount contains not just the direction the telescope needs to move, but also for how long. With ST-4 guiding, once the software decides the mount needs to move, it will cause the camera to close an electronic “switch” to move the mount. When the move is done, the switch is opened. With pulse guiding, there is no (possible) time-lag resulting from ST-4 mode guiding having to send an additional command to open the switch. On the other hand, ST-4 fans say that since no back and forth computer talking is needed with ST-4 mode guiding, it must be inherently more responsive. The ground truth? With my mounts/scopes/guide-cams, there was absolutely no difference in accuracy between the two methods. The pluses for each have more to do with convenience. If you are controlling your mount with a computer, why not pulse guide? If you are using EQMOD in particular, that seems a natural—everything, goto commands and guide commands, is routed to the mount over a single cable. On the other hand, while ST-4 guiding requires an additional cable run from camera to mount, there’s no fooling around with serial connections and USB to serial adapters, which is a good thing. I normally do ST-4 for that reason. The other question concerns the guide-scope or lack thereof. What sort of a guide-scope should you use? In my opinion, the answer is one with a focal length of about 400 -500mm. That provides a fairly wide field for small guide-cam sensor chips, but also has enough image scale for precision guiding. The venerable Short Tube 80mm is a good choice as long as you can lock the focuser down firmly and mount the whole thing securely to prevent image-destroying flexure. Me? I use a short focal length 50mm finder-guider. One of these will work up to about 1200 – 1300mm of imaging scope focal length, and is small, light, and easy to mount firmly. For anyone who doesn’t top 1000mm of imaging scope focal length, a finder-guider is a natural. Having that wide field is often a blessing when it comes to choosing guide stars. There’s always the option of doing without a guide scope, too. Using an off-axis guider (OAG) which intercepts a small amount of the light coming out of the main scope for guiding. Obviously, since you are guiding through the main scope, there is no flexure to worry about. If you are running an imaging telescope at over 1500mm of focal length, you may find an OAG is your only workable option. The downside? You only have access to stars at the edge of the main scope’s field, and for that reason it can be quite difficult to find a good guide star. Luckily for me, a long time OAG hater, I rarely image at a focal length long enough to require one. One final thing to discuss before we do “brain surgery.” How good does your guiding have to be? How much error is acceptable? The answer is, “that depends.” At 1000mm or less with an APS-C sized camera sensor chip, an RMS error of around 2” or so is good enough. Stars will be round and small enough to please. You can even get OK (if sometimes not perfect) stars at that error level to about 1500mm of focal length. It’s a good thing this degree of error is acceptable at the focal lengths I use, since the plebian mounts I have in my inventory, GP clones like we discussed last week, and the EQ-6 and CGEM mounts a step above them, will deliver 2” of RMS error with fair ease. Getting guiding much tighter than that with these sorts of mounts isn’t always easy and will often take considerable experimentation. The first entry here is “Search Region.” This is the size of the tracking box PHD2 draws around a star. Normally you should leave this at the default value. If you have so much drift between guide exposures that the box needs to be larger, you aren’t going to get anywhere with guiding anyway. 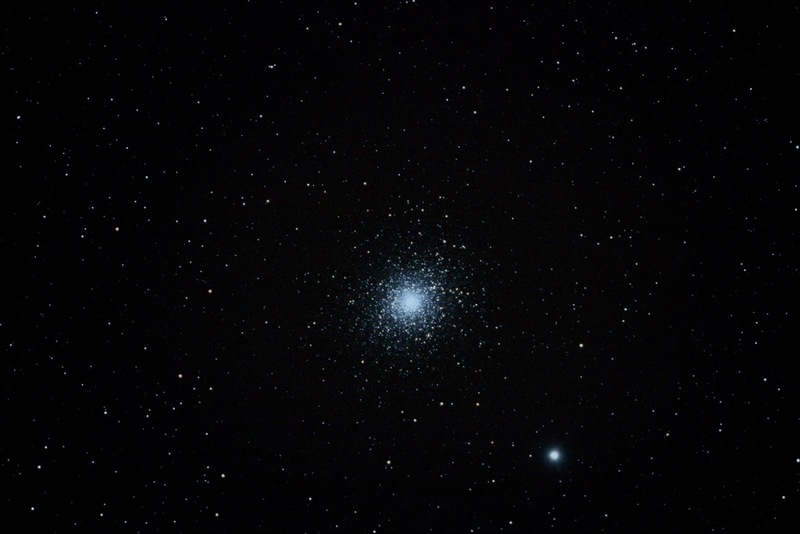 The accompanying “Star Mass Detection” has to do with PHD2 monitoring the star’s brightness as compared to the sky background. Leave this as is as well. Likewise, leave the tolerance setting for Star Mass Detection alone. 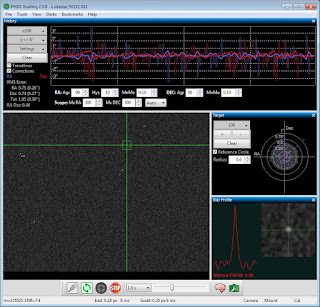 The next part of the window is quite important, “Calibration.” Enter the focal length of your guide scope (you should already have entered the size of the guide-cam’s pixels in the “Camera” tab), push the button labeled “Calculate,” and PHD2 will figure out how long guide pulse duration should be during calibration. The main concern here? 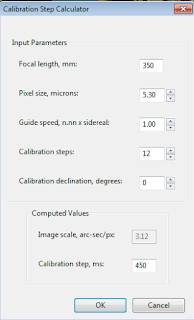 If you have a short focal length guide scope like I do, you need to enter a much higher calibration step size than the default. I have a value of 1350 here. 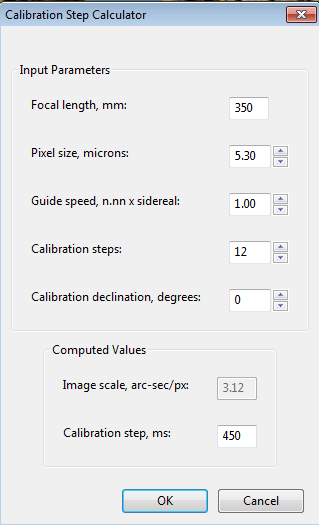 Given the short focal length of my 50mm finder-guider, I need that large a setting. Otherwise, calibration would take all freaking night to complete. Leave the other stuff here alone. Here’s where we get down to the nitty gritty, the place where you can change the settings that really and truly affect guiding. You’ll see that the window is divided in two, with one area for right ascension and one for declination. Let’s begin with RA. The first thing to set is Hysteresis. PHD2 is pretty smart; it can remember what the last RA correction was like and use that information in formulating the next correction. The number here is a percentage. It is how much the remembered previous correction affects the next one. At 40%, the next RA correction will be 40% based on the magnitude of the previous correction, and 60% on the star movement PHD2 is seeing at the moment. What should you set it at? More Hysteresis yields smoother guiding. Too much, however, and a sudden guide star movement will not be adequately compensated for. I have my value at 40%, which seems OK. Coupled with Hysteresis is “Aggressiveness.” That setting is how much (as a percentage) of the calculated necessary movement PHD2 actually sends to the mount. The reason for this is to decrease the chance of the mount overshooting the star, going back the other way on the next guide command, and overshooting in that direction too, “ping-ponging.” Normal settings rage from about 70% to 100%. I am set at 85%. Next is “Minimum Move.” This is the amount the star is allowed to drift without PHD2 issuing a guide command. The reason for this is to reduce unneeded guiding corrections caused by non-tracking related star motions due to seeing or other momentary events like mount vibration, wind, etc. The default is .15 and that’s where I’ve left it. Max RA duration, the last setting on the RA side, is similar to the above in that it’s meant to smooth out guiding, to prevent herky-jerky guiding. This figure is in milliseconds, and limits the duration of the RA guide command. I’ve settled on a value of 1200 for RA through trial and error. I am thinking that is low, however, and might try a higher value next time out. First up is “Resist Switch,” which means PHD2 tries to avoid reversing the guide direction in declination. That is always a good thing, since in many cases issuing a guide command in dec to go back the other way will be a problem. Star movement in declination opposite the constant slow (you hope) drift caused by polar alignment errors is usually caused by seeing, vibration, mount flexure, wind, etc., and as with RA, we want to avoid issuing guide commands for these things. Most of all, many mounts have considerable backlash in declination, which would create a considerable time lag between command and movement if the mount reversed direction in dec.
Also on the declination agenda are aggressiveness, minimum move, and backlash compensation settings. I have the first two at the same value I have for RA. 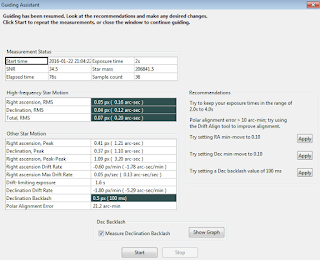 The backlash compensation option determines whether PHD2 will use a backlash compensation value it has computed if a declination correction opposite the previous one needs to be issued. I have this off, since I don’t seem to be having any major dec problems. 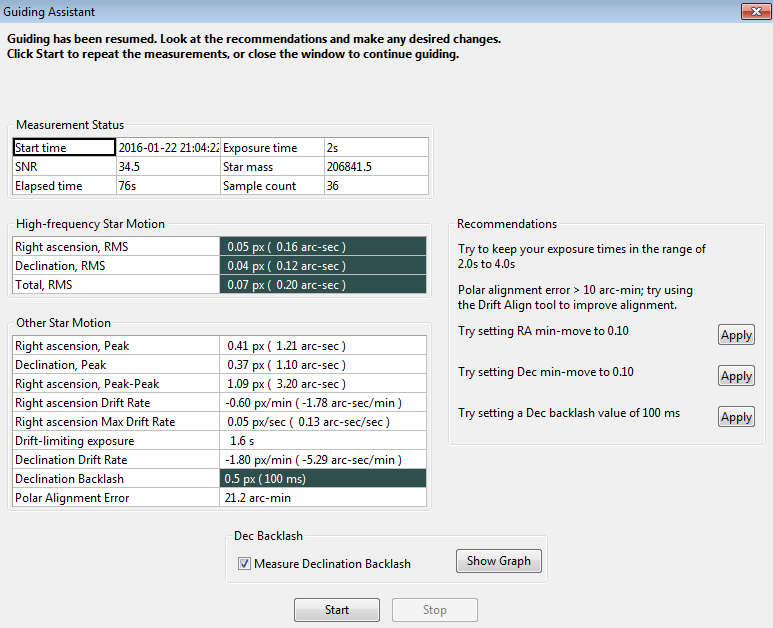 Max Dec Duration has the same purpose as in RA, to smooth guiding. I have my value set a little higher here than I do in RA, 1500, but it could probably be higher still. And that is it, folks. The other Brain tabs cover use of adaptive optics guiders and are of little interest to most of us. How do you fine tune your mount if these values don’t work for your particular setup? Trial and error, which was what I did to arrive at the numbers I’ve given here. There is one alternative, though, PHD2’s “Guiding Assistant.” Theoretically, invoking this tool should allow the program to decide what your guiding values should be. When the procedure has completed its work, it will make suggestions, which you can implement or ignore at your discretion. Alas, when I tried Guiding Assistant some time back, one night at the 2015 Peach State Star Gaze, the figures PHD2 came up with seemed to make my guiding worse rather than better. However, that was over a year ago, so the Assistant may have been improved by now. If you invoke it and use the suggestions, make sure you’ve written down your old numbers so you can get back to the way things were if Guiding Assistant doesn’t work for you. Good advice. I have recently switched to PHD2 from an SBIG STV standalone guider. Like you, I use a small finder-guider (60mm) because it is more rigidly built than an ST80; what it lacks in focal length, it makes up in steadiness. Have you tried Metaguide? I have not (yet). Great stuff! There is lots of periodic error on my home built platform limiting me to 10 to 20 seconds. So I need to upgrade. With an old 12 inch F5 dob that the OTA (Metal) weighs in at 34LBS. It is difficult to find a mount in my price range. Timely blog, made my Monday train ride easy. Would help me a lot with guiding which I have been trying to avoid. While I agree that both guiding via ASCOM and ST4 are equivalent, there is one significant advantage of using ASCOM "pulse guiding" in PHD2. Since PHD2 is aware of the declination of the mount, it does not require re-calibration when slewing to new areas of the sky, and can automatically calculate a new guiding calculation to save time when shooting multiple targets.